Hello and welcome back to the El Charrito blog! If you love Mexican food in Salinas and the Monterey area then you are right where you need to be. On the El Charrito blog, we talk about all things relating to the food we serve at our authentic Mexican restaurant. Recently we discussed some of the health benefits of the food we serve and why it should be a part of your New Year’s resolution to eat more Mexican food. We also blogged about the difference between authentic Mexican taquitos and their Americanized counterparts. We also shared about one of the few alcoholic beverages worthy of being imbibed while eating Mexican fair and that is tequila. 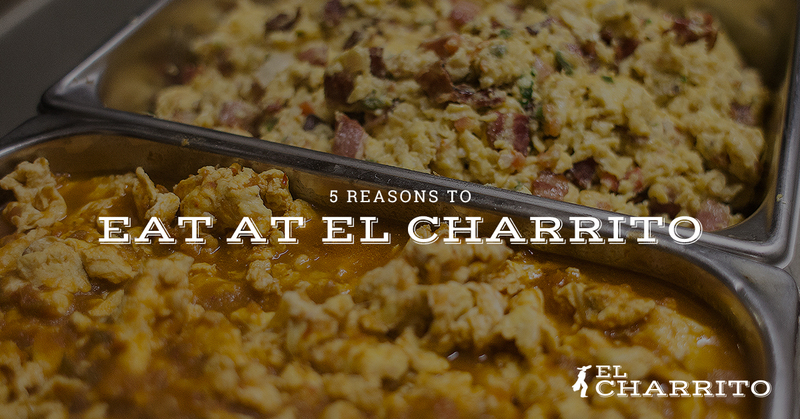 Today, we are going to give you more reasons to come eat with us at El Charrito in Salinas. Keep reading or come get your cure for hunger with us! Have You Tried Our Burritos? If someone asks you why you want to eat at El Charrito, you can ask them, “Have you tried their burritos?” We hate to brag, but our burritos are pretty amazing and it’s not just us who think so. Monterey County Weekly named El Charrito the Best Burrito in the area! We are delighted that they appreciated our delectable creations. We offer a variety of flavors and combinations that you have to try. Have you ever been hungry and wanted to eat your favorite food and the restaurant that serves said food is simply not open? We’ve all been there and had to deal with the devastating blow. However, you don’t have to deal with that when you eat with El Charrito! We are open for breakfast, lunch, and dinner, and are serving up delicious flavors at each meal. Love our delicious South of the Border fair? Come dine with us whenever you want or multiple times in the day! When you eat with us you have options. We offer five different kinds of breakfast burritos, nine different burritos, 5 kinds of salsas, and multiple side options. Not in the mood for a burrito? You’ve still got options! Trying to cut carbs? Get a torta or plate instead of a burrito and enjoy the same delectable flavors. Does having options intimidate you? No problem! We’d love to help you find a flavor concoction that will make your palate smile. Even though we give you options, we do our best to keep it simple, because ultimately, it’s about fresh ingredients, delicately crafted flavors, and food that delights the soul as much as it fills the stomach. You would think that for how delicious our food is that it would cost an arm and a leg. Not so! Enjoy El Charrito at reasonable prices! Burritos start at $3.19 with our most expensive meal being our plate option that is $7.59 and served with twice the amount of meat found in a burrito, rice, beans, salsa, and two house-made tortillas! El Charrito has been serving up mouth-watering flavors for over 30 years. We love our neighbors in Salinas and the Monterey area. Whether you are a local and have been a patron of our authentic Mexican restaurant for years (Thank you!) or you’re just passing through, we hope that you enjoy your time with us and that you never leave hungry or unsatisfied. Now that our blog has whet your appetite, come in and visit us!